Hiring Mellady Direct means hiring a team with decades of experience in everything from graphic design and content development to printing and mailing, plus a full range of marketing and PR services. Are you on a tight timeline? There’s no need to stress out. With same-day and next-day digital printing capabilities, Mellady Direct excels at providing the high-level service you need now. Stop dealing with multiple vendors. We are equipped to handle every aspect of your direct marketing, from initial concepts and design, through strategy, implementation, printing and mailing. Mellady Direct Marketing has been an invaluable asset to our marketing and fundraising efforts. Their attention to detail, flexibility, and deep experience in the industry has made Mellady Direct my go-to for KIPP LA’s mailings and materials. They always take the time to make sure our final product is cost-effective, beautiful, and on-time. I look forward to working with Mellady Direct on all of our future projects. We appreciate working with the Mellady Direct Marketing team for our printing and mailing needs. For over 10 years we have been able to count on Mellady to be helpful, efficient, creative and trustworthy. We highly recommend Mellady to anyone looking for a printing and mailing vendor. Mellady Direct Marketing always delivers. Their services are timely and effective. All their staff is knowledgeable and very patient with my questions. Jim is always returning my calls or answering my emails no matter how busy he gets (which I know they are!) I highly recommend! Thanks again for your quick response. I enjoy working with you. You make my life so easy! Big hug. I started working with Mellady Direct Marketing six months ago when I came to work for Benchmark Communities. I took over the responsibility of ordering all of our business cards and stationery. From the first day I knew that we would have a really great working experience. Mellady Direct always responded back to me in a timely manner on any question I had or order that was placed. We always received our orders in perfect condition and in a quick and timely manner. They are awesome to work with. Mellady Direct Marketing is prompt, highly professional, and provides outstanding service. All of our print and mailing projects have been executed to our satisfaction.  Their service representatives are experts in print processes and mailing logistics, and always provide us with helpful guidance to help maximize savings and improve the quality of our printed material. Working with Mellady Direct Marketing has been nothing short of excellent. They bring to the table years of experience and an expert’s approach. The Mellady Direct team has been a vital component in accomplishing our goal of elevating our brand and continuing to provide great customer service. We really view them as an extension of the Lundgren team, and have found them to be as focused as we are on creating excellent work. As a client, you are in very good hands when you choose to do business with Mellady Direct. Mellady Direct Marketing is an invaluable asset to our organization. Consistently instrumental in helping us grow and thrive, they’ve offered us the means to increase our visibility and influence on the community around us. They really get things done! My business has used a printer in the valley for years but when our contact left we had no go to person and I felt like a fish out of water. I tried another local printer and they were unprofessional and unreliable. It’s important for any business to have a good relationship with a printer and I prefer local if possible. We have business cards, trade shows, Marketing materials – some odd request and Mellady can handle it all. They do fantastic work for all of our printing. They are responsive, professional, they do QUALITY work and their prices are very good. They are not far from my office and they deliver which is convenient. My business has used a printer in the valley for years but when our contact left we had no go to person and I felt like a fish out of water. I tried another local printer and they were unprofessional and unreliable. It’s important for any business to have a good relationship with a printer and I prefer local if possible.  We have business cards, trade shows, Marketing materials – some odd request and Mellady can handle it all. They do fantastic work for all of our printing. They are responsive, professional, they do QUALITY work and their prices are very good. They are not far from my office and they deliver which is convenient. 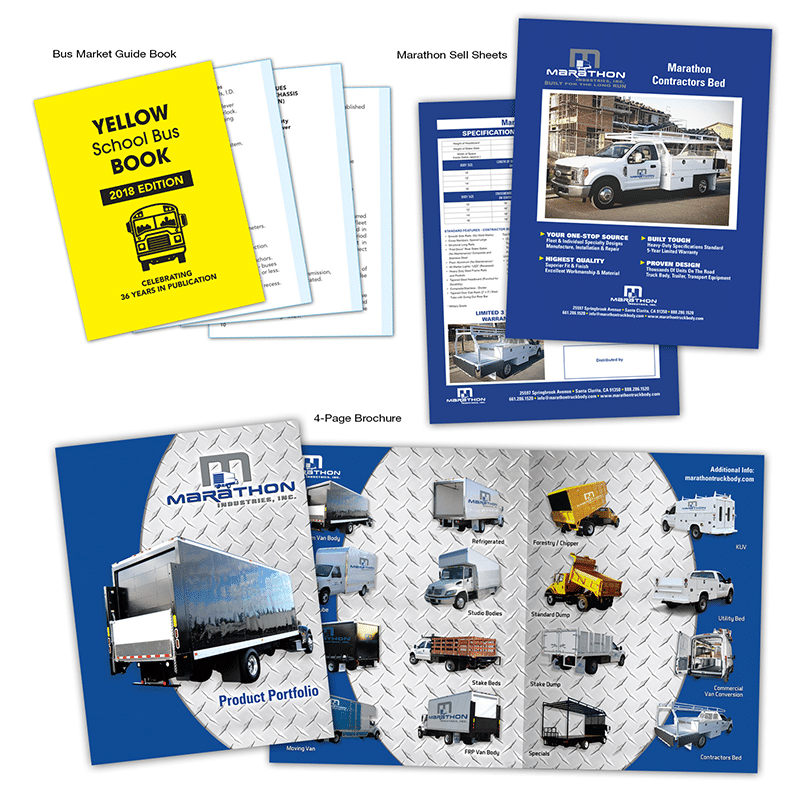 We can always count on Mellady Direct Marketing for our critical printing and mailing projects. Their proven reliability, competitive pricing and strategic insights make them a valued partner. I entrust my printing and mailing to Mellady Direct not only because I know my projects will ship on schedule, but also because I know that each piece will reflect the professional, upscale image my company is known for worldwide. I appreciate their prompt responses to my questions, and continuous and accurate communication regarding the progress of my projects. They always go above and beyond to meet our specific — and sometimes last-minute — needs. Sometimes good business relationships just creep up on you like when a good friend becomes a significant other. This is exactly how my relationship with Mellady Direct started. I was in need of something fairly specific and the Mellady team was ready to help. Their attitude fit my firm’s mantra of ‘only working with nice people’ perfectly! From that single phone call, I soon found myself fully engaged in doing business with one of the Southland’s finest direct marketing firms. Mellady understands with a business relationship, you trust that person with your career and your reputation and your ongoing ability to feed your family. (And the same goes in the opposite direction.) Business relationships are great, but they are even better when you’ve created a friendship first.  Whether you recognize it or not, all successful small businesses, regardless of what they do or sell, have one thing in common: their owners know how to build and maintain relationships. Beyond a superior product and exemplary customer service, this is the key to Mellady Direct’s success. Here’s to friendships and good business practices! We are very pleased with the service provided by Mellady. They communicate detailed product information so we know what to expect and respond to our needs in a timely manner. Our business moves quickly and we can always depend on a fast turnaround time from Mellady. Mellady Direct Marketing has been a trusted business partner with our City for many years. They are consummate professionals who continually provide excellent customer service with everything they do. I appreciate their continued efforts that regularly go above and beyond to fulfill our printing and mailing needs. Their entire team represents what makes the Santa Clarita business community great. 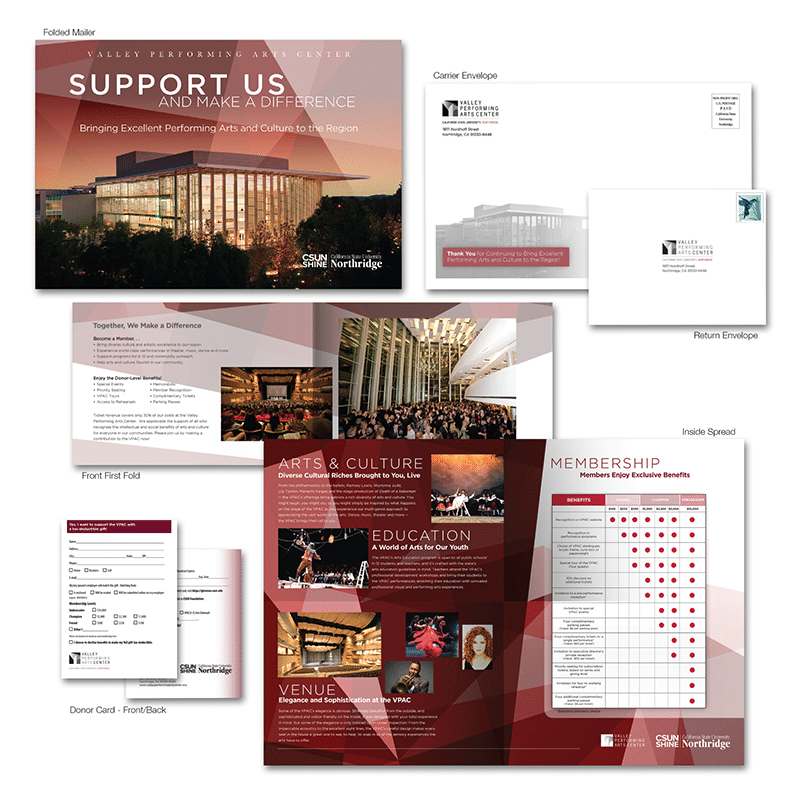 Mellady Direct Marketing stands alone in its class as a direct mail marketing service for the Valley Performing Arts Center, at California State University, Northridge. Nowhere else have I found better pricing, faster service and friendlier customer relations. Mellady Direct’s team of hands-on professionals go above and beyond standard practices to ensure that outcomes of every project are superb quality products and the customer is 100 percent satisfied every time. They are wonderful to work with and truly the best in the business. 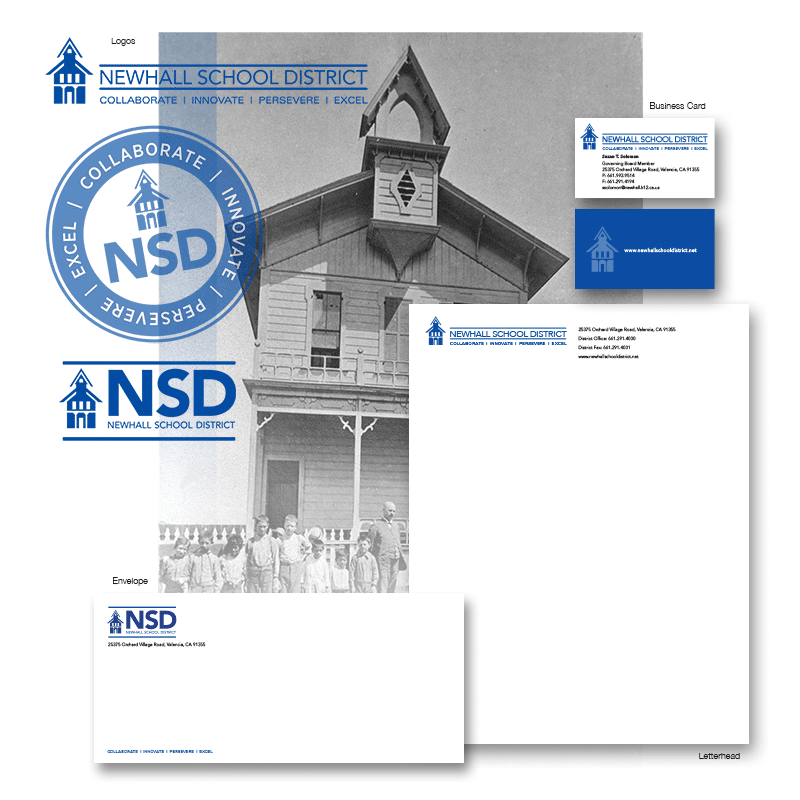 Replacing an existing, dated logo and branding represented a step into the future for the Newhall School District. Reflecting public and leadership input, the Mellady Direct team was able to expertly craft something that stands as both a nod to our history and is still fresh and updated. In addition, their assistance with public relations has proven invaluable for the district. They are an asset to the community, and I was impressed by the breadth and depth of their experience. The Mellady staff is highly skilled and very responsive to client needs. There has never been I time when I have not been able to depend on them for a quality result. These folks really care. A full-service printing, direct mail, graphic design and online marketing firm, providing everything from initial brand development to complete strategic integrated marketing campaigns. Engage in Mellady Direct and you can stop dealing with multiple vendors. We are equipped to handle every aspect of your direct marketing, from initial concepts and design, through strategy, implementation, printing and mailing. Let us handle the details so you can focus on your other responsibilities. Whether you’re in need of a basic logo design or a full marketing overhaul, we can work with you to develop marketing that defines your brand and helps you stand out, get noticed, and get results. We work with everyone from small local businesses, to national companies and organizations, but they all share one thing in common: they each receive the same dedicated, hands-on service. Established in 1985, Mellady Direct is a leading print and digital marketing firm. With three decades of experience and thousands of direct marketing campaigns, we offer a complete range of services to small, medium and large businesses belonging to various industries. We deal in every aspect of direct marketing. Our talented team of experts have years of experience in everything from graphic design and content development to printing and mailing, coupled with a full range of marketing and PR services. We are fully committed to your success and won’t stop working until you are 100% satisfied with our instant and cost-effective services. We care about your needs, and are always available to help you. 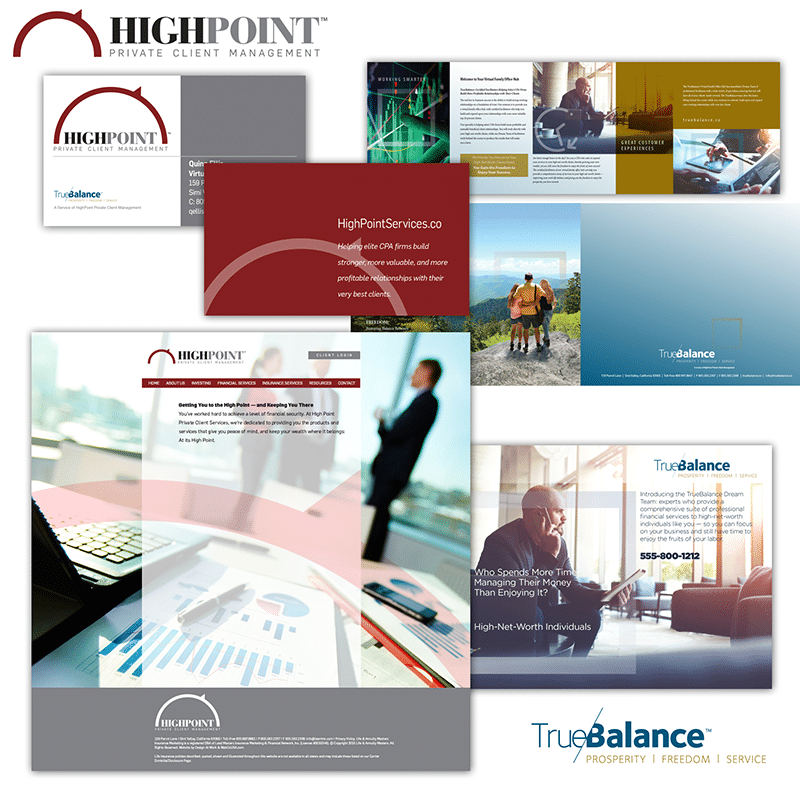 HighPoint Private Client Management needed all-new print and electronic marketing materials. Mellady Direct took care of it all, for both HighPoint and its TrueBalance services for financial professionals. 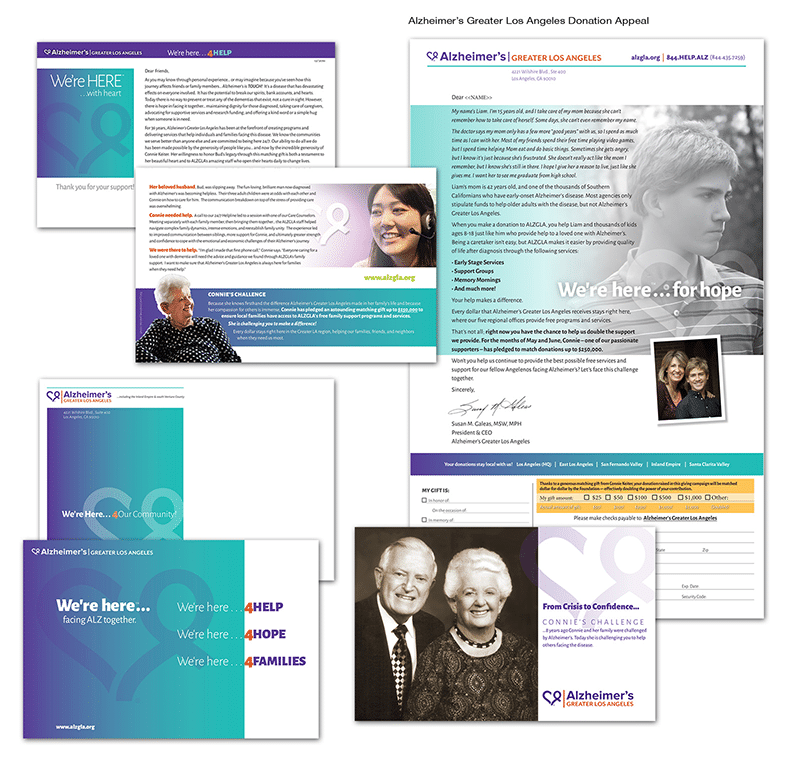 In creating the giving campaign for ALZGLA, we told real-life stories of families who turned to the organization for help in coping with memory-afflicting illnesses. 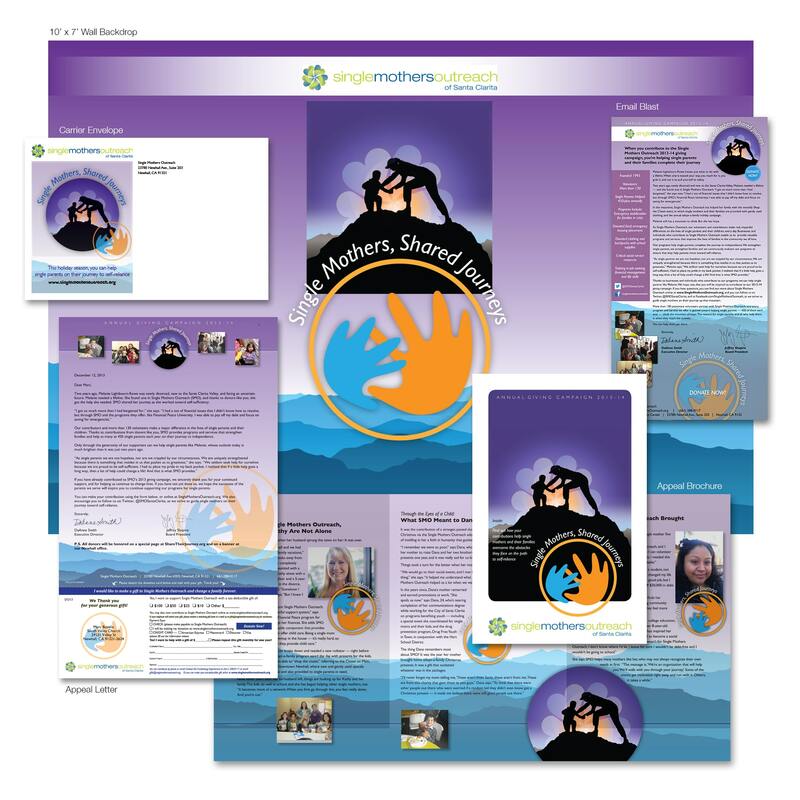 Single Mothers Outreach was looking for a fresh approach, so we created an all-new theme and design for the nonprofit’s giving campaign. We were proud to create this direct mail campaign for Operation Gratitude, which delivers care packages to U.S. troops worldwide. We created a rebranding for the Newhall School District that is both true to its rich heritage and more contemporary than its previous materials. 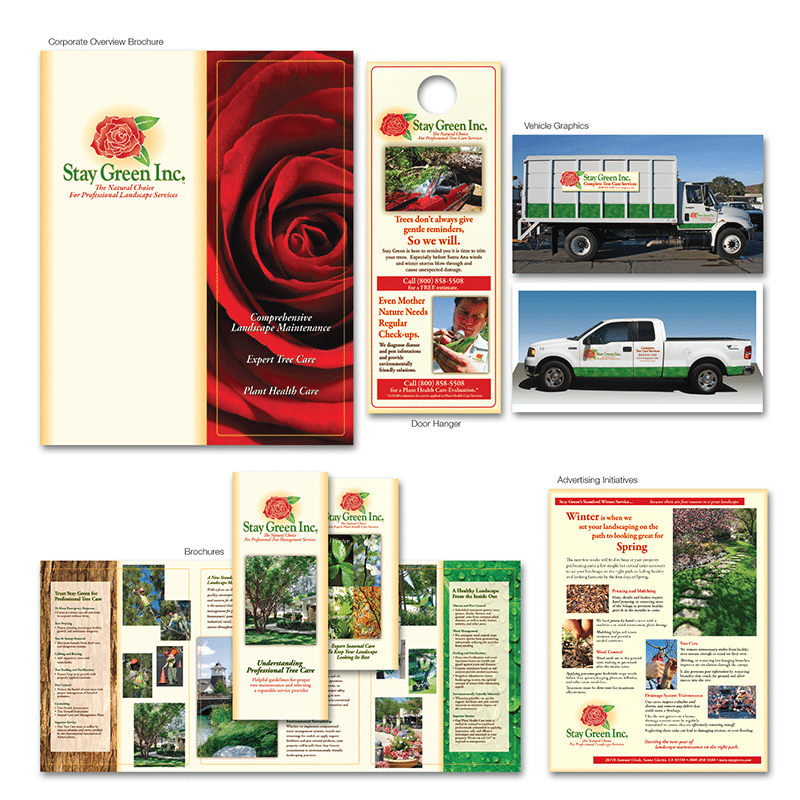 We’ve delivered a complete array of marketing materials for Stay Green Inc., an innovative leader in the landscape industry. 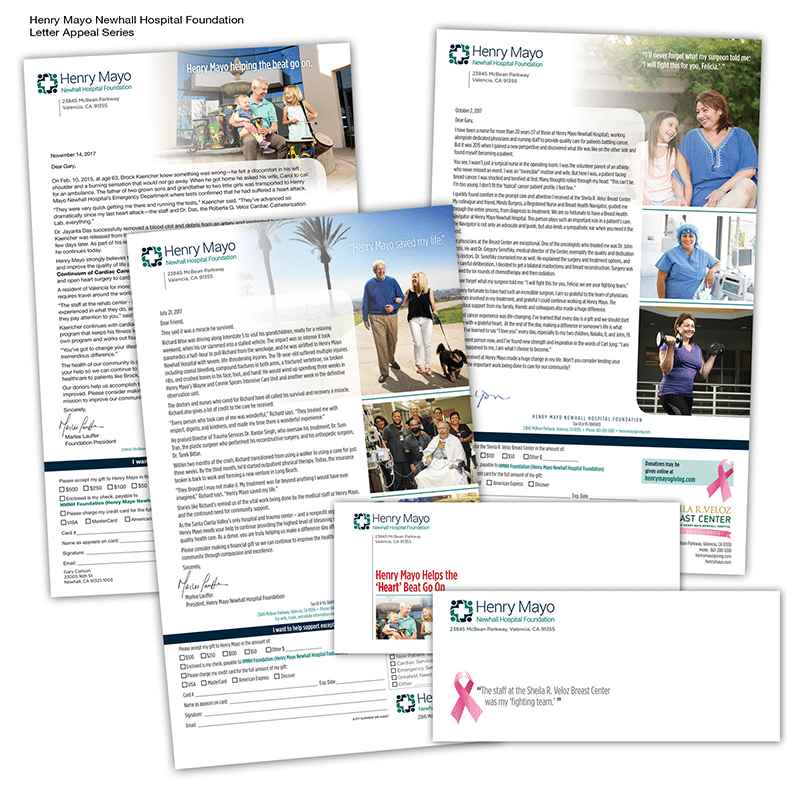 Our copy, design, printing and professional mailing services combined to create a series of powerful letters that told stories of the life-saving medical services at Henry Mayo Newhall Hospital. We’re proud of the outreach materials we created for the state-of-the-art Valley Performing Arts Center at Cal State University, Northridge. 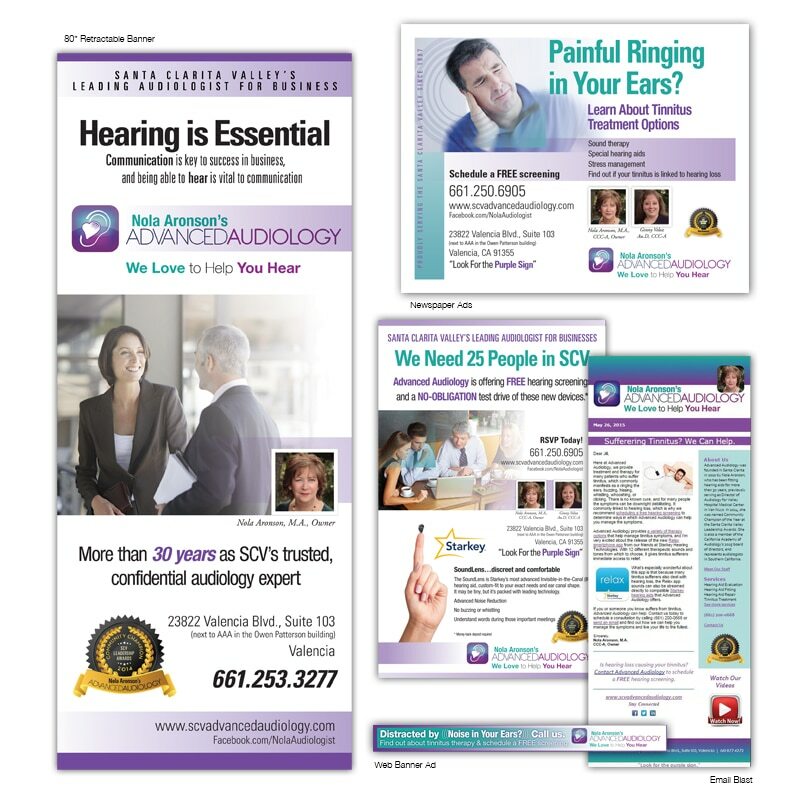 Nola Aronson’s Advanced Audiology uses state-of-the-art technology to help people hear better. We make sure her message is heard!